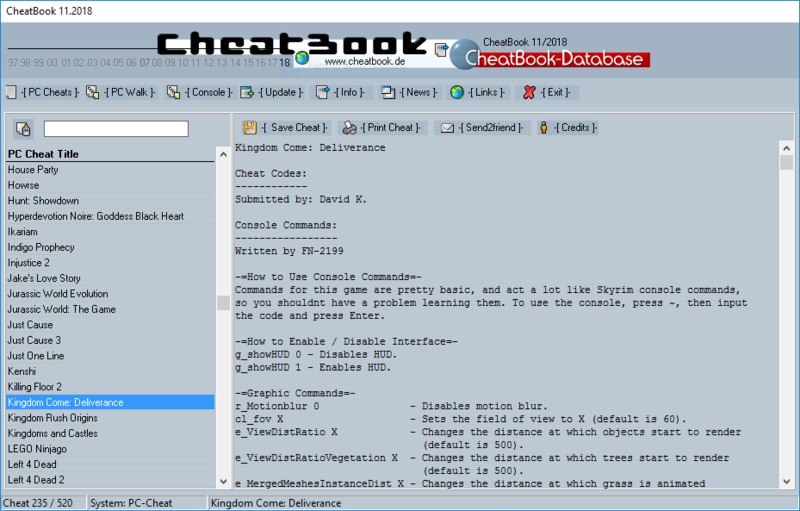 CheatBook (11/2018) - Issue November 2018 - A Cheat-Code Tracker with Hints, Tips, Tricks for several popular PC Action and Adventure Games. 520 PC Games, 9 Walkthroughs for PC and 46 Console Cheats are represented in this new version from Strategy Games, Adventure Games to Action Games. This Database represents all genres and focuses on recent releases. Games are listed alphabetically in the left-hand window. When you highlight a game, the relevant cheat is displayed in the right-hand window, with convenient buttons that let you print the selection or save any changes you've made.If you need help with the latest and greatest games, CheatBook should be a big help. If you have installed the CheatBook-DataBase 2001 through CheatBook-DataBase 2017 or the new version CheatBook-DataBase 2018 you will be able to update your DataBase directly. This program can be distributed on CD-ROM, Disks, magazines, homepages etc... It is Freeware.